In the last few days I updated 2 of my plugins – Completely Delete and Unsortable Meta Box, there is nothing huge, I just removed the WordPress Settings API wrapper from them, and created the settings pages based on Tom McFarlin’s WordPress Settings Sandbox. When developed these 2 plugins, to use or not to use any WordPress Settings API wrapper, that is the question kinda bothered me. I was hoping Tom could integrate the settings page to his Plugin Boilerplate, but got no luck. The barrier kept me from using the Settings API was, even though the Codex looked simple – with only 10 functions I could create a settings page, I had no idea when to use which function. 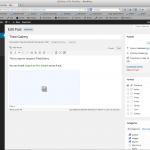 The 1Fix.io website (blog) went public on Jan 3, 2014. For the first 7 days I tried several channels to do marketing. Here’re some thoughts I’d like to share. I find it’s kind of hard to promote a new plugin. After publishing my first plugin – Completely Delete, I was so happy but didn’t know what to do next. I’ve read the Plugin Submission and Promotion on WordPress Codex, but got no luck for 2 WordPress Activities and Announcement Sites they recommend were stalled for a long time. Then I checked out several WordPress communities on Google+ to see if I could write some promotion or introduction about my plugin, got no luck again for promotion posts are not allowed in most of these communities. Have you ever wondered a quick way to delete all children while delete a post in WordPress? Completely Delete is the right plugin for you. We also make these children posts could be restored, while their parent posts are recovered from trash. A ‘Completely Delete’ link will be added to the row actions. A ‘Completely Delete’ link will be added to the left of Update button.